Kanaoka, M. (2019). A pedagogical attempt to promote Japanese college EFL learners’ self-growth. Studies in Self-Access Learning Journal, 10(1), 61-78. Drawing on Ushioda’s (2009) L2 motivation theory “a person-in-context relational view (PCRV)”, this study provides relevant ELT methodology utilizing a semester-long core English course for Japanese college EFL learners (N = 63), involving the underpinnings of spirituality (e.g., Baker, 2003). The language instruction aimed at the organic integration of identity, inner spirituality, and relevant L2 practice and self-expressive L2 use, all related to successful self-development of the EFL learners. The objectives were three-fold: to examine (1) the effects of the employed teaching methodology, (2) the emergence of relevant L2 learning methods, and (3) the enhancement of self- and identity-focused L2 use capabilities. These points were analyzed respectively with focus on the aspects of: (a) PCRV, (b) spirituality, and (c) target language acquisition (TLA) for an authentic self-expressiveness. Four self-focused stages and spirituality-laden tasks were administered, and relevant questionnaires were prepared. The research findings of t-tests for pre- and post- collected data (Weeks 1 and 15) yielded significant results for (1), (2), and (3) with respect to the three aspects. The participants’ open-ended statements (Week 15) reported perceptible self-growth and relevant L2 practice, including positive self-image as a person, followed by the role of English and new impressions of the English language. Current research of a second/foreign language (L2) motivation is oriented toward a person (i.e., self and identity) as a whole human being, rather than as a learner constrained by linguistic and communicative competence. This emergent perspective can be recognized, for instance, in dynamic systems and contextual interactions (Ushioda & Dörnyei, 2012). There, identity, context, and relevant target language acquisition (TLA) are emphasized with L2 learners’ successful self-development and its supportive L2 practice. Identity refers to each learner’s “sense of self as a language learner or use in relation to a particular linguistic community or learning context” (Mercer, 2012, p. 12). In self-and-identity-concerned language education, context is deemed to be “how the activities, symbols, and texts used in one or more social worlds produce the components of a social world—identities, roles, relationships, expectations, norms, beliefs, and values” (Beach & Myers, 2001, p. 17). I mean a focus on real persons, rather than on learners as theoretical abstractions; a focus on the agency of the individual person as a thinking, feeling human being, with an identity, a personality, a unique history and background, a person with goals, motives and intentions; a focus on the interaction between this self-reflective intentional agent, and the fluid and complex system of social relations, activities, experiences and multiple micro- and macro-contexts in which the person is embedded, moves, and is inherently part of (Ushioda, 2009, p. 220). Ushioda (2013) made a critical inquiry of what language and language learning mean to L2 learners, referring to “the ambivalences and complexities of how they see English fitting into (or not fitting into) their personal system of values, goals and identities” (p. 10). In other words, in Ushioda’s (2006) account, it is presumed that motivation for learning and using a second/foreign language is fostered by each learner’s belief and sense of value. Prima facie, the notion of spirituality intimately resonates with the hallmark of Ushioda’s L2 motivation theory as noted above, since spirituality also looks into the meaning, goals, and orientations in human life (Baker, 2003), thus focusing on “the thoughtful awareness of an inner feature of human experience” (Priestley, 2005, p. 210), such as personal beliefs and senses of value. In other words, spirituality acts as an agent toward inner strength, and as a force of meaning-making toward a dynamic expression of self and identity, with the development of self-transcendence in mind (Astin, Astin, & Lindholm, 2011, pp. 4-5). Ushioda’s viewpoint is essentially embedded in successful self-development, which needs to be facilitated at least by virtue of the maturity of inner self (e.g., fostering personal beliefs and senses of value), namely, spiritual aspects. Mindful of these notions and concerns, introducing an ELT methodology aimed at epitomizing the underpinnings of PCRV and spirituality becomes an authentic pedagogical challenge. It is therefore worthwhile to explore how PCRV-spirituality-amalgamated ELT contributes to fostering not only a matured L2 person, but also relevant language learning practice and language use. Much L2 instruction focuses on the learner rather than the person, largely due to traditionally supported ELT praxis targeting linguistic competency as the authentic learning outcome. Meanwhile, ELT methodology aimed at embracing PCRV and spirituality at a tertiary level has been rarely administered and examined in Japanese college EFL, in particular that focusing on self-development, well-matured L2 learning methods, and perceptible L2 use capability as a tripartite entity. As a research aim, it is imperative to design and introduce classroom-based activities with focus on these perspectives. Ushioda (2011a) conceptualized L2 motivation as “an internal representation of how one sees oneself and what one wishes to become” (p. 202), a target language as “a means of self-expression and self-development” (p. 202), and a foreign language as “a personalised tool that enables us to expand and express our identity of sense of self in new and interesting ways” (Ushioda, 2011b, p. 228). Drawing on these notions, it might be beneficial to allow Japanese college EFL learners to explore, engage in, and recognize how their L2 practice (learning methods and target language use) may become practical in pursuit of their self-growth. In this regard, they need to be encouraged to create a fully-fledged self-description of who they are, what they want to be, and what they ought to be by forging an idealistic self-image (i.e., good character). In other words, an imperative L2 accomplishment is to look at the whole person, while dealing with a surface level of the self (e.g., basic self-introduction and real world self-orienting) as well as looking into an inner part of the self (e.g., tangible descriptions of personal beliefs and senses of value). This agenda fundamentally corresponds to the hallmark of spirituality as mentioned earlier. Accordingly, the following research questions were addressed. RQ1. Is it possible to implement an ELT methodology emphasizing PCRV, spirituality, and relevant TLA for successful self-development and better description of self and identity? RQ2. Utilizing this instruction, is it possible to develop corresponding L2 learning methods? RQ3. Is it possible to develop relevant L2 use capability recognized through individual L2 learners’ perception and convincing awareness gained through their empirical and cognitive engagements of L2 practice? RQ4. It is possible to elicit some tangible responses that suggest or witness the emergence of self-growth as a person, or a newly emergent aspect of using the English language? Participants comprised first-year college students at a national university (N = 63, male = 44, female = 22). The students were taking a one-semester long weekly English course in the second semester of the 2016 academic year (15 class periods), mainly designed for production-oriented L2 use including self-focused oral presentations. Students (all Japanese, mostly aged 18 and 19) were from three faculties of non-English majors: Agriculture, Education, and Engineering. In this core English course, the aim of the current research was explained to them in the first week (i.e., during the course guidance), indicating that it more or less overlapped with the course content and goal in terms of seeking successful self-expressiveness using English. As a result, all of them acknowledged and agreed with the aim, thus participating in the study and all participants completed the course. Relevant questionnaires using a Likert-type scale were provided in order to investigate RQs 1 to 3 and administered twice. The responses were: 1 = never applied/not true at all, 2 = not applied/not generally true, 3 = neither/no idea, 4 = applied/ generally true, 5 = much applied/very true (RQs 1, 2); or 1 = I cannot do it at all, 2 = I cannot generally do it, 3 = I have no idea (neither can or cannot), 4 = I can generally do it, 5 = I can do it very well (RQ3) (see Appendix for details). In the questionnaires, two questions each relate to (1) PCRV, (2) spirituality, and (3) TLA for better description of self and identity. For RQ 4, multiple choices (Yes or No) and follow-up open-ended questions asking for detailed information (response and impression) were administered at the end of the course. This instrumentation was specifically designed as part of the intervention necessary in the current research. In the research setting, four stages were provided for the students as an instructional intervention. The aim of the first stage, self-positioning, lies in clarifying their reasons and purposes for entering college and choosing their current major. The second stage, self-orienting, has them envisioning an intended career plan or goal after graduation (e.g., desired workplace or graduate school; type of occupation or specialized research field). The third stage, self-imaging, has them depicting a concrete image of their ought-to-be self as a mature person (e.g., socially acceptable and responsible attitudes and behavior, together with relevantly required personal beliefs and senses of value), and the final stage, self-directed decision making, focuses on actualizing tangible expressions of they are and what they want to be and ought to be (i.e., creating a self-determined message that represents or reflects solid mindset in aphorism style). The characteristics of PCRV and spirituality were critically valued. It was essential to adopt a holistically organic stance of integrating the self, identity, the real world, philosophy of life, and critical language use altogether. In this regard, social constructivist L2 practice and ELT played a vital part, in particular in fostering agency. Agency is “not simply an individual character or trait, but a contextually enacted way of being in the world” (van Lier, 2008, p. 163). Additionally, character formation was emphasized because it crucially relates to PCRV and spirituality. In college education, self-development for good character is deemed crucial (Arthur, 2010) as it pertains to the maturity of spirit. A self that has been nurtured will lead you to what you really want to do. Material possessions rust away, wear away, or depreciate. Character alone will never tarnish. Culture is not enough; there must be an ethical dimension to whatever you study. If you don’t have a philosophy of life, let me warn you that the world you are about to enter is a dangerous place to go looking for one. If you stick to your integrity and your goals, eventually the world will appreciate what you are doing. Identity is something that one must create for himself by choices that are significant and that require a courageous commitment in the face of anguish and risk. Identity is one’s witness to truth in one’s life. A challenge is necessary to improve myself. Every mistake is a stepping stone toward success. Living is not breathing but doing. The first and best victory is to conquer the self. There is always light behind the clouds. University is the place to find what I will be. You make habits and habits make you. In forging the whole story, practical writing skills were explained (e.g., unity-focused top-down logical framework, transitions for better coherence, parallel structure for stylistic sophistication). The aim of this writing task was to create a presentation script in one paragraph (approximately 150-180 words). For language development (language maturity), another task was administered. The students wrote a five-paragraph essay (approximately 300 to 320 words). Using their life story already created in one paragraph, they added more detailed information (e.g., examples, reasons, facts, etc.) to make their beliefs and sense of values more authentic and convincing. The completed essay was used for production-oriented L2 practice, including reading aloud (paralanguage) and kinesics. Creating a visual aid was also required. Through these multi-layered tasks, the college learners endeavored to become self-directed, self-decisive, resilient, and prudent in exhibiting, demonstrating, and appreciating who I am, what I want to be, and what I ought to be, while engaging in truly important language acquisition and use. The results of t-tests on responses for effects of ELT methodology (RQ1) were examined in Week 1 (α = .83) and Week 15 (α = .78) and six items evidenced substantial impact (Table 1). In terms of the three highlighted aspects (PCRV, Spiritualty, TLA for Better Description of Self and Identity), t-tests of the mean scores exhibited substantial change from lower to higher values (Table 2). The L2 learning methods (RQ2) corresponding to RQ1 for the six items were examined in the same way (Week 1, α = .64; Week 15, α = .83). After applying the Bonferroni adjustment (p = .008), three items (Belief and Value; Character Forming; Paralanguage-Centered) indicated statistically significant learning transformation (Table 3). Mean scores for two of the three aspects (PCRV and Spirituality) were clearly improved (Bonferroni adjustment: p = .016) (Table 4). Regarding L2 use capability (RQ3), the same six items were examined (Week 1, α = .78; Week 15, α = .87). Except Kinesics, statistically significant enhancement emerged for five items. Of these, the four pertaining to PCRV and Spirituality were rated positively in Week 15 (M = 4.00 or beyond). Furthermore, two items of Spirituality were changed from negative to positive levels (Table 5). All three aspects exhibited self-recognized improvement (Table 6). In sum, the overall results shown in Figure 1 illustrate pre-post comparisons centered on the three aspects. Figure 1．Overview of Pre-Post Comparisons Focusing on PCRV, Spirituality, and TLA. As Figure 1 shows, the ELT methodology indicated its practicality in all three aspects (W1 vis-à-vis W15 ELT). Successful self- and identity-focused L2 use can also be seen (W1 vis-à-vis W15 L2 Use). Specifically, in terms of PCRV and Spirituality, the post-test results surpassed those of ELT. On the other hand, the post-test results for L2 learning methods were lower than those of ELT and L2 use, and were not rated positively (W1 and W15 L2 Learning). As has been evidenced from the overall results, in conjunction with the pedagogical impacts (RQ1), the L2 learning methods have transformed in terms of PCRV, Spirituality, and TLA for Self-Description (RQ2). These three aspects were also empowered in L2 use capability (RQ3), along with personal growth as illustrated from some self-determined messages. Together with extensive positive responses, concrete explanations of perceptional and behavioral changes as a person and for the English language were also reported (RQ4). In reference to these results, the following points are to be noted. Firstly, it has been reaffirmed that “language learning can be an experience related not only to language and communication, but also to personal growth” (Rubio, 2014, p. 54). In supporting this truth, the language teacher’s responsibility is to map out socio-philosophical contexts, for the L2 learners’ duty is anchored in “the struggle of a person (self) … in maintaining the integrity of the self” (van Lier, 2010, p. xiii) from wider, multi-disciplinary aspects. In this vein, the current research has targeted the three aspects, anticipating that good L2 learners “strive to make a foreign language more meaningful to themselves, but what is also important is that they strive to make themselves more meaningful to others through using the language” (Arnold & Murphey, 2013, p. 2). In accomplishing this aim, identity, agency, and social context are inseparable (Duff, 2012). And in fortifying the core/inner part of self, spiritual training constitutes a critical part. Secondly, in successful L2 learner development, contextualization is important. In the employed pedagogical intervention, the four organically connected stages served to develop authentic self-and-life stories. For these self-and-identity-concerned contexts, not only personal history (past-present-future: explicit real world), but also a self-verified mindset was crucial. In other words, for the quest of inner spiritual growth, self-examined beliefs must become a vital agent. Quasthoff (2001) explained that contextualization is “the forward and backward oriented sense-making forces of each move” (p. 224), in which contextual relevance and integration are processed sequentially. In other words, context can no longer be regarded as an analytical entity; rather, it should be deemed as “dynamic relational, and a parts-whole configuration” (Fetzer & Oishi, 2011, p. 2). Ushioda (2015) argued that the context should be a holistic entity in which self, linguistic characteristics, motivation, self-esteem, agency, and linguistic competence are equally embraced. Otherwise, weak and fragile contextualization may engender superficial, unstable, or fragmented English learning motivation (i.e., immature motivation). Finally, in promoting self-directedness and self-efficacy as a token of personal growth, well-balanced L2 use supported by well-designed contexts and spiritually challenging tasks is indispensable. Empirical, cognitive, and spiritual self-focused TLA-aimed L2 experiences need to be perceived as meaningfully authentic for college L2 learners. In effect, this conviction can encourage each learner to become more proactive and self-directed in seeking the twin maturities of self and language use. 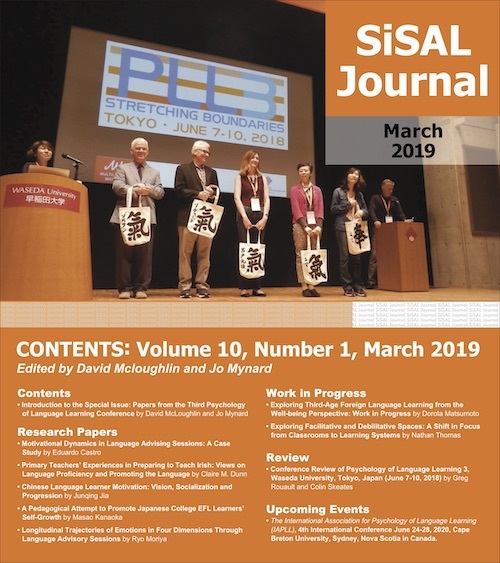 Despite a limited research period, this study put pedagogical emphases on the feasibility of well-balanced self-and-language development among the Japanese college EFL learners, focusing on four domains as articulated in the research questions. As indicated by Table 3 and Figure 1, in the current research setting including employed materials and administered tasks, facilitating the transformation of the learners’ L2 learning methods into a positive level (i.e., being into a mature level) was proved not easy through their recognition and perception. As previously noted, while ELT and L2 use capability were successfully improved, the struggle for well-conceivable transformation of English learning strategies, approaches, and practices remained as a difficult achievement goal for the learners. This issue also applies to the domain of TLA for better description of self and identity (i.e., L2 use capability utilizing paralanguage and kinesics). Hence, toward a higher level of research outcomes, more elaborated and precisely designed ELT interventions and task administrations will need to be provided in the further study, with a longer research period secured. Concerning the last research question, another research agenda is to conduct an extensive investigation for validating individual learners’ self-growth by utilizing text analysis with focus on their self-determined messages. Text analysis works effectively in extracting reliable key concepts from open-ended written statements, as well as in exploring and eliciting semantically salient aspects hidden in the created messages. Using this technique, it is worthwhile to present tangible numerical data and visual interpretations as an evidence (or a clue) of personal growth arising from the inner part of self. Truly authentic L2 motivation must nurture insightful and critical awareness of the self, identity, and society. In this respect, it has been evidenced that PCRV and spirituality act as powerful agents. In substantiating idealistic self-images, language learners must step back and reflect on themselves with focus on both life-orienting and inner spiritual aspects. The foremost duty of college learners is to examine themselves and their language use while putting themselves in maturity-aimed self-orienting contexts. Their ultimate goal is to empower their agency characterized by authenticity, spirituality, solid identity, and good character. The author is grateful for the anonymous reviewers’ productive feedback and precise guided instruction for polishing up the contents and scholarly nature of the earlier manuscript. Creating research concepts and ideas for the current research is partly indebted to face-to-face talks with Dr. Ushioda in the U.K. and Tokyo, focusing on her current publications. This study is supported by a Grant-in-Aid for Scientific Research (JSPS KAKENHI Grant Number 16K02846). Masao Kanaoka, Ed.D., is a professor of Kagoshima University (Japan) and teaches English as a foreign language. His research field: curriculum and instruction using self-theories, social constructivism, and public philosophy. Current research focus: integrating spirituality and Dr. Ema Ushioda’s L2 motivation theories into authentic L2 context and language use. Arnold, J., & Murphey, T. (2013). Introduction. In J. Arnold & T. Murphey (Eds. ), Meaningful action: Earl Stevick’s influence on language teaching (pp. 1-6). Cambridge, U.K.: Cambridge University Press. Arthur, J. (2010). Of good character: Exploration of virtues and values in 3-25 year-olds. Exeter, U.K.: Imprint Academic. Astin, A., Astin, H., & Lindholm, J. (2011). Cultivating the spirit: How college can enhance students’ inner lives. San Francisco, LA: Jossey-Bass. Baker, D. (2003). Studies of the inner life: The impact of spirituality on quality of life. Quality of Life Research, 12(Suppl. 1), 51-57. Bark, S. (2005). Take this advice: The best graduation speeches ever given. New York: Simon Spotlight Entertainment. Beach, R., & Myers, J. (2001). Inquiry-based English instruction: Engaging students in life and literature. New York, NY: Teachers College Press. Duff, P. A. (2012). Identity, agency, and second language acquisition. In S. M. Gass., & A. Mackey (Eds. ), The Routledge handbook of second language acquisition (pp. 410-426). New York, NY: Routledge. Fetzer, A., & Oishi, E. (2011). Introduction. In A. Fetzer & E. Oishi (Eds.). Context and context: Parts meet whole? (pp. 1-8). Amsterdam, The Netherlands: John Benjamins. Green, M. (2007). Self-expression. Oxford, U.K.: Clarendon. Mercer, S. (2012). Self-concepts: Situating the self. In S. Mercer, S. Ryan & M. Williams (Eds. ), Psychology for language learning: Insights from research, theory and practice (pp. 10-25). New York, NY: Palgrave Macmillan. Morson, G. S. (2012). The long and short of it: From aphorism to novel. Stanford, CA: Stanford University Press. Priestley, J. (2005). The spiritual dimension of the curriculum: What are school inspectors looking for and how we can help them find it? In C. Ota & C. Erricker (Eds. ), Spiritual education: Literacy, empirical and pedagogical approaches (pp. 201-215). Portland, OR: Sussex Academic Press. Rubio, F. D. (2014). Self-esteem and self-concept in foreign language learning. In S. Mercer & M. Williams (Eds. ), Multiple perspectives on the self in SLA (pp. 41-58). Bristol, U.K.: Multilingual Matters. Quasthoff, U. M. (2001). Context. In R. Mesthrie (Ed. ), Concise encyclopedia of sociolinguistics (pp. 218-215). Oxford, UK: Elsevier. Ushioda, E. (2009). A person-in-context relational view of emergent motivation, self and identity. In Z. Dörnyei & E. Ushioda (Eds. ), Motivation, language identity and the L2 self (pp. 215-228). Bristol, U.K.: Multilingual Matters. Ushioda, E. (2013). Motivation and ELT: Global issues and local concerns. In E. Ushioda (Ed.). International perspectives on motivation: Language learning and professional challenges (pp. 1-17). New York, NY: Palgrave MacMillan. Ushioda, E. (2015). Context and complex dynamic systems theory. In Z. Dörnyei, P. MacKintyre, & A. Henry (Eds. ), Motivating dynamics in language learning (pp. 47-54). Bristol, U.K.: Multilingual Matters. Ushioda, E., & Dörnyei, Z. (2012). Motivation. In S. Gass & A. Mack (Eds. ), The Routledge handbook of second language acquisition (pp. 396-409). New York, NY: Routledge. van Lier, L. (2008). Agency in the classroom. In J. P. Lantolf & M. E. Poehner (Eds. ), Sociocultural theory and the teaching of second languages (pp. 163-188). London, England: Equinox. van Lier, L. (2010). Forward: Agency, self and identity in language learning. In B. O’Rourke & L. Carson (Eds. ), Language learner autonomy: Policy, curriculum, classroom (pp. ix-xviii). Bern, Switzerland: Peter Lang. Note. This instrument was originally created and used in Japanese for the participants. The six questions for RQs 1 to 3 relate to three aspects: (1) PCRV, (2) spirituality, (3) TLA for better description of self and identity. Each of two questions comprises (1), (2), (3) respectively (questions 1, 2 = (1), 3, 4 = (2), 5, 6 = (3); see below). Note. Week 1 focused on previously experienced ELT styles before taking the administered English course in this research; Week 15 focused on the ELT style of the administered English course. employing tasks and assignments in order for envisioning life-orientation. providing opportunities to consider the connection between real society and the self. employing tasks and assignments to clarify personal beliefs and senses of value. providing themes for character forming through self-maturity. strengthening read aloud, paralanguage, and other speaking practices. strengthening gestures, facial expression, and other kinesics practices. considering the connection between real society and myself. clarifying my personal beliefs and senses of value. my character forming through self-maturity. the reasons for selecting the currently enrolled university, the department, and the major. my future life goal and career plan after graduation with concrete reasons. my important personal beliefs and senses of value. relevant self-determined message created in the form of aphorism. exercising necessary paralanguage to fully convey my thoughts, ideas, and feelings. exercising necessary kinesics to fully convey my thoughts, ideas, and feelings. Education majors included mathematics, science, music, fine arts, etc. In exemplifying the concept and the content of the questions, (1) Ushioda’s theoretical underpinnings and educational emphases on PCRV, (2) important aspects of spirituality education in college (Astin, Astin, & Lindholm, 2011; Baker 2003), and (3) theories from self-expressiveness (Green, 2007) were taken into account. The validity of the instrument (based on the numerical scale) tailored for RQs 1 to 3 was examined in a pilot study in the first semester of 2016 involving first-year students (N=115) in the same university (all non-English majors different from the participants employed in this study). The test had a fairly acceptable level of internal consistency reliability: RQ1 questions (α = .78), RQ2 questions (α = .71), and RQ3 questions (α = .79). As Morson (2012) explained, the hallmark of aphorism is anchored in wise sayings and wisdom arising from worldviews. Wise sayings view the world as “providential, guaranteeing reward for prudence and righteousness” (ibid, p. 7) and wisdom concerns not only human life, but also the human being itself in pursuit of self-verifying truth. Short speech messages (i.e., aphorisms) from U.S. college commencements were cited from books of college graduation, including Bark (2005).